Farming paragon, farming ancients, and farming for new builds. Join the hosts this season to finish off your season strong. The PTR is still up and running strong, find out more with Deadgreed’s Necro and Witch Doctor. Hear about some theory crafting for next season. What gear will you run with in a LON build? What rings will you wear? * Book of Tyrael giveaway! Episode 205 – The Ancient Vault! Whaaaaaaaat?! The PTR is up and running strong with new updates. Curious about the Ancient Vault? Wondering what buffs to gear are coming for season 17? Getting excited about T16 but want more information about it? Come listen in! Do you have a shine for RN-Jesus yet? If not, you might want to set one up. Greed shares his fortune with a new toon he is running for this season. Also, find out what is going on in the PTR and what is planned for season 17. Have any ideas about builds? What do you think about LON builds and which are your favorites? Be ready for this very special and very lengthy episode of the Shattered Soulstone. We have a special guest this episode, Dreadscythe, and he explains his thoughts behind his own Development Hell #4. You get to hear about the creation process behind this community based masterpiece. Vespertilio and Shazam take this episode on a ride through their weeks in gaming then strike up some conversations brought to you by emails from the fans! Find out a bit about Titan, a canceled Blizzard project, and how it later started the making of Overwatch. The hosts also cover Diablo 1, a little Diablo 2, and Diablo 3. Deadgreed, Vespertilio, and Shazam are looking for new builds to serve many purposes! Will you don your gear and show them what you got? In this episode, our party shares what they have been up to in their weeks in gaming. They then discuss new ways to share builds and tips via other websites. Do you have any suggestions to add to their conversation? We finally have emails! Stay a while and listen to what some listeners have to say and what questions they share and answers the hosts provide! Continuing the quest in season 16 we have Deadgreed, Vespertilio, and Shazam back at it. Come to find out how far they have gotten on their goals or lack there of! The groups discusses what is going on at Blizzard and the 800 people that got laid off. We are now streaming the show live as we record on twitch! Listen in to find out more information! Episode 198 – Change Over… Switch! 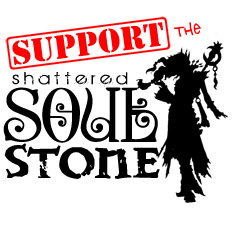 Taking the stage in this weeks episode of the Shattered Soulstone is Deadgreed, Vespertilio, and Shazam! This past week has seen a lot of changes in what these three have been up to in game. New toons, different builds, gearing, happy moments, and sad moments alike. Listen in to find out all that is new. Book of Adria! If you have not seen this brand new book full of lore and art, you need to check it out right now! Click the link in the blue notes below! Want to work for Blizzard Entertainment? Are you fascinated by the world of Sanctuary? Go to the Blizzard career page and check to see if one of the 16 new Diablo related job postings are for you. The link is in the blue notes below. * Book of Adria! Check it out in the blue notes below! Episode 197 – 100 Levels Up in Smoke!! In this episode Deadgreed brings in Shazam to talk about what they have been up to in game. Shazam has achieved a new personal record of greater rift 109 with the Shadow Impale Demon Hunter and is still working his way to his seasonal goal of reaching paragon 2000. Deadgreed brings up a possible bug involving the Nemesis Bracers. What do you think about it? In game, Deadgreed has been pushing his greater rifts in groups for glory and gear. * New personal records, glory, and gear!